Mr. Andy in the News! Andy Yung, a prekindergarten teacher in Queens, is adept at raising money online for ambitious classroom projects, but even he sometimes pays for supplies out of pocket. And he has company. According to a federal Department of Education survey released on Tuesday, 94 percent of public school teachers in the United States reported paying for supplies without reimbursement in the school year that straddled 2014 and 2015. About eight hours away in Flushing, Queens – New York City’s most diverse borough – Andy Yung teaches a class of 4-year-olds at a school that’s focused on giving them a healthy start. The kids are active and moving around a lot, and their parents are encouraged to provide them with healthy mid-day snacks, like yogurt, fruit and veggies, to give them the fuel they need to stay focused on learning. But healthy food can be pricey, and some families don’t have the means to provide it. A section for all those times Mr. Andy made it to a newspaper or news story! 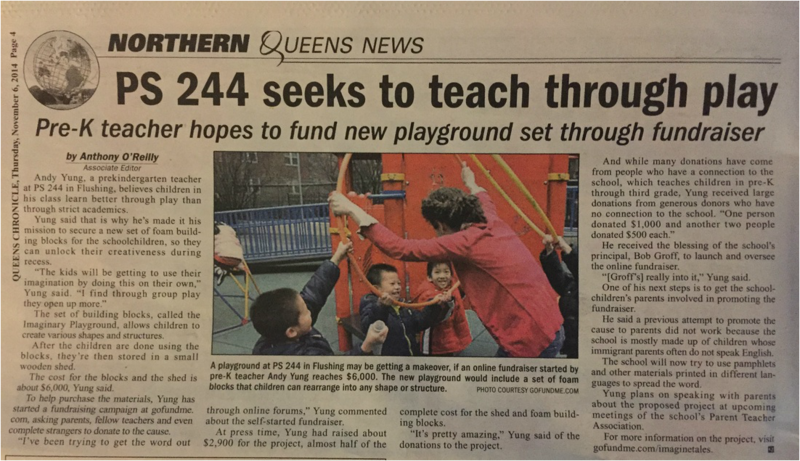 FLUSHING, NEW YORK – What started out as a crowd-sourcing effort is now reality for Pre-K teacher Andy Yung and his class of Jedi’s-in-training at PS244 in Flushing, Queens. The first of its kind, the afterschool enrichment class combines the love of Star Wars and fitness. “It’s more about showing our kids that there are different ways to stay fit and active,” Yung told PIX11 News. “Other than the standard that they know, that they’ve learned in gym class or anywhere else.” Every class starts out with a standard warm-up, which includes stretches, planks, two rounds of lunges and a few laps around the gym. The Padawans eventually duke it out with a choreographed battle that follows the principles of Tai Chi with the same movements and health benefits. Click HERE for the Story and Video! It's a "World of Orchids" in Queens this weekend. The Queens Botanical Garden is where you can find more than 250 pots containing Taiwanese orchids, and there are numerous works of art by contemporary artists. The program's manager says the exhibit is a good example of how culture is celebrated every day at the Garden, which tries to showcase more than pretty blooms. "We have two days of robust programing, collaborative dance perfromances, movie screenings, instlation art and what better way to ceelbrate then here at the garden with flowers? So we welcome them here with open arms," says Queens Botanical Garden Programs Manager Regina Forlenza. The exhibit runs until 5 p.m. Sunday and is included with admission to the garden. Click here for the article and video! When Andy Yung first asked his boss for permission to purchase more than a dozen lightsabers, the request was met with more than a little skepticism. A pre-K teacher at The Active Learning Elementary School in Flushing, Queens — and an avid Star Wars fan — Yung was proposing his idea to start a "Young Jedi Academy" for his students. TALES was founded seven years ago with the mission of promoting health, wellness and creativity among its students, and has been no stranger to out-of-the-box learning programs in the past. But school-sponsored lightsaber fights were a tad much even for them. Click here for the full story and pictures! A long time ago in a galaxy far – well actually not that long ago or that far away. It’s at PS244 in the Flushing section of Queens where a movement is underway. 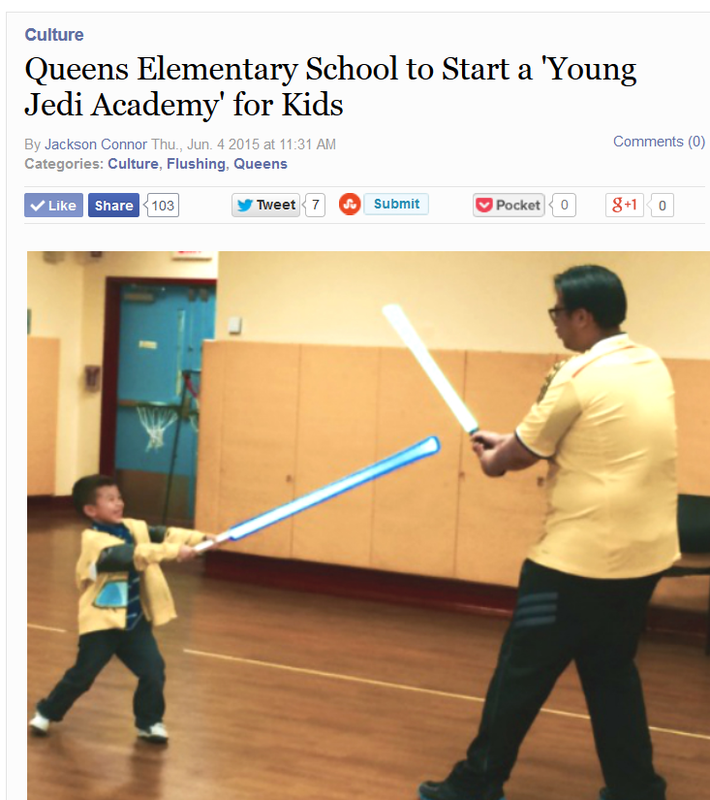 Pre-K teacher and Star Wars fanatic Andy Yung is on a mission to launch a Young Jedi Academy, an after school program that will teach students how to get fit – the Jedi way. Click here for full story and video! 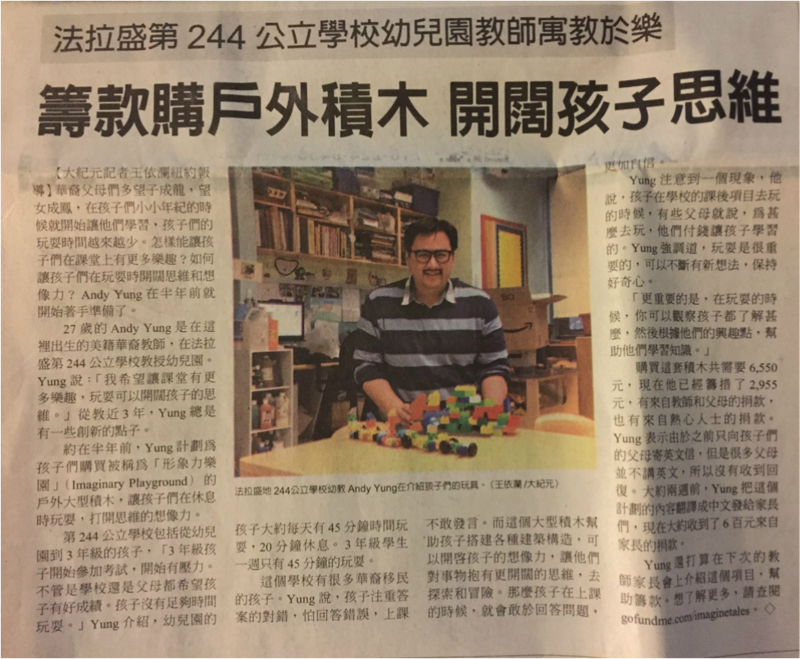 Andy Yung, a prekindergarten teacher at PS 244 in Flushing, said he believes children in his class learn better through play than through strict academics. Yung said that is why he’s made it his mission to secure a new set of foam building blocks for the schoolchildren, so they can unlock their creativeness during recess. Andy Yung of FLushing, a pre-K teacher at P.S. 244Q The Active Learning Elementary School, was awarded first place and a $1,000 community grant in the fifth annual Clifford the Big Red Dog BE BIG in Your Community Contest, organized by Scholastic Media and HandsOn Network. The national contest is a signature program of the ongoing Clifford the Big Red Dog BE BIG campaign. 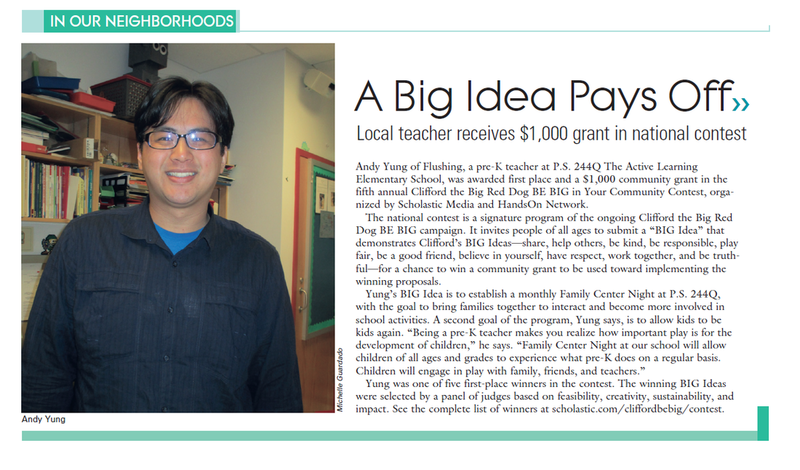 It invites people of all ages to submit a "BIG Idea" that demonstrates Clifford's BIG Ideas- share, help others, be kind, be responsible, play fair, be a good friend, believe in yourself, have respect, work together, and be truthful- for a chance to win a community grant to be used towards implementing the winning proposals. 27-year-old Chinese-American teacher Andy Yung is born here, Pre-K teacher in Flushing 244 public schools. Yung said: "I want to make classes more fun, play can broaden children's thinking." From teaching nearly three years, Yung always have some innovative ideas. About six months ago, Yung plans for the children to buy large outdoor building blocks known as the "image of the force paradise" and let the children play at rest, open imagination thinking.